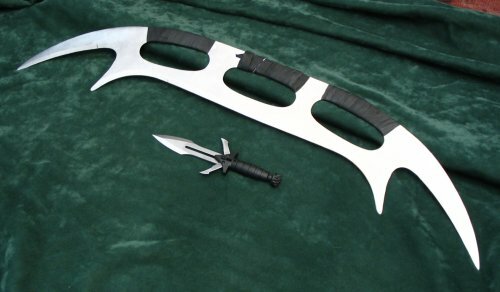 A Bat'leth?? Was it a 9th century one or a common 23rd century model? My foot struck it such that the sharp edge went just inside the pinky toe. 'Ware the dog. I was out exploring in the woods with our dogs, hacking my way through a thicket of dead bramble roses with my trusty machete, when my wife's dog bolted after a rabbit or something at just the wrong time. Thock. Right in his head. It wasn't nearly as bad as it might have been, but it was a real eye opener. Not to mention a really awkward conversation with the vet. "Can you meet me as soon as possible? I just hit Boomer in the head with a machete." "You WHAT?!" That could have been gruesome. I'm glad he has a hard head, and I was able to pull back most of the power when I saw what was happening. Lots of things in here to give me pause when I think about swinging a real, sharp sword. I don't currently own a real sword, and the one I have on order won't come sharp. Dare I sharpen it? Definitely not without reading and digesting the rest of this old thread, at least. Posted: Tue 14 Jul, 2009 8:51 pm Post subject: Still safe? In honor of a recent request for people to report on their safety incidents, I'm bringing this thread back to the top. This thread was originally posted in 2005. What are your thoughts on it now? Do you have another story to tell? What do you intend to wear the next time you perform solo cutting exercises with sharp swords? D) Boots, jeans, and a heavy shirt. F) Sandals and shorts. No shirt. G) Sharp things scare me. I never go near them. 2. Use the right tool for the job. Consider the kind of training you are going to engage in and the most appropriate weapon: sharp, blunt, waster, or whatever. Is using a sharpened blade REQUIRED to accomplish your training? Is there a substitute that is equal to the task? 3. Consider alternative training exercises. Most of what people think of as "test cutting" could be done as "test hitting" exercises on a pell with blunts. In my opinion that's almost just as fun but nowhere near as risky. I was doing some FMA forms with a sharp tanto before I'd had my morning coffee (i.e. before I could think.) Before too long I was heading off to the E.R. to get a nice stab wound in my thigh sewn up. A few inches over and it would have been a *really* bad day. I learned my lesson to avoid sharps in daily training. I received a sword recently packed in a box with packing peanuts, and inside that the sword was sheathed in a cardboard tube just the right size to stay tension fit on the blade. I thought it was ingenious and am keeping the tube until I get a scabbard made for it. Moderately safer than a bare blade and cheap.